I went to this restaurant in liberty village. They claim to serve authentic southern italian specialties but really what it is, is the chef going to the grocery store close by and buying prepackaged foods and assembling them – but charging for authentic good quality foods. My friend and I ordered the gnocchi which was suppose to be homemade but was pulled out of a packet and dumped into water. The cheese and meat antipasto was a plate of prosciutto and a mozzarella ball – not burrata which is what any decent Italian restaurant would serve but instead we got the cheese that is $7.99 at the grocery store sitting in a bag of water. Then there was the radicchio which was good but he had cheaped out on the ingredients. This meal that was represented as authentic southern Italian cuisine ended up being an assembly of the cheapest ingredients he could find, yet the bill came to $60. Needless to say I will never go there again. But looking at the menu, the items were good – in theory but overpriced. The best thing I had that night was the radicchio salad even though it was missing ingredients listed on the menu. But I thought to myself, I could make this at home and make it better…and so I did. This salad is made to order, it doesn’t keep well. So I prep a had of radicchio and keep in the fridge for up to a week. It makes about 4 cups. Then when I want to salad I take it out and make about a cup at a time. Quarter and cut the radicchio finely into thin ribbons. Cut the onion in half and thinly slice into half moons. Add to bowl and mix well, making sure onions are separated and mixed throughout the lettuce. Store in a plastic container. Take 1 heaping cup of radicchio mix and put in a bowl. Drizzle oil and vinegar. Add salt and parmesan. Mix well with 2 forks. Finish with a dusting of parmesan. 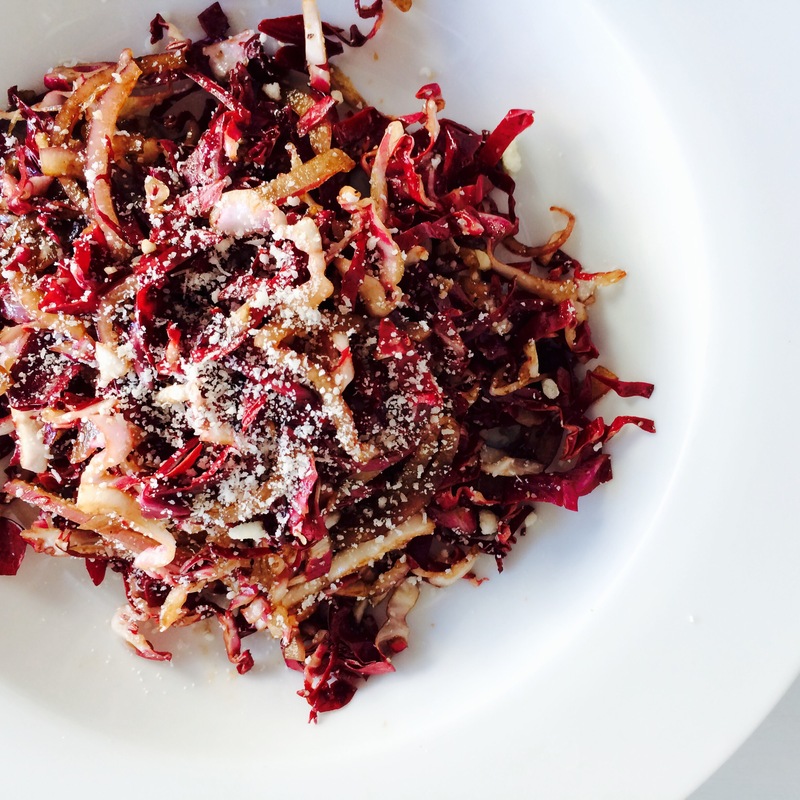 If you are going to use the whole head of radicchio (family size serving) then add 4 tbsp. of the oil and cheese, and 2 tbsp. of the balsamic.